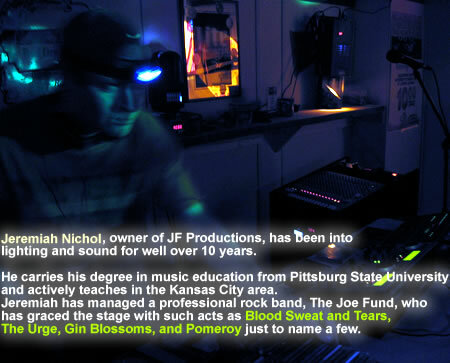 JF Productions is your sound solution. Whether you are a band seeking to have value added sound and lighting or a couple ready to exchange your vows in marriage, JF Productions will be there every step of the way. From clubs to boxing events, motorcycle events to school functions, JF Productions guarantees a top notch production to suit your needs. On hand we have 4000 watts in sound and 5800 watts in DMX intelligent lighting. It doesn’t stop there. We have around us many agencies who can adequately handle shows up to 10,000 and JF Productions will see to it every step of the way that your needs are exceeded. CLICK HERE TO CHECK OUT MY HOME PAGE AS A MUSIC EDUCATOR! Non-stop beat-match variety DJ with a sense of humor along with a sense of timing. I'm not always on the mic. I believe that wedding receptions are also a time for families to get together as well. If the floor isn't packed, I'm not the type of DJ to beg people over and over to come to the dance floor, give them blow-up guitars or goofy hats to get them involved. Typically early on folks want to drink and have conversation. Later on, when the people start coming out to the floor, I turn my mixing abilities on and the whole place turns into a very hip night club! The atmosphere is energetic, yet relaxing and non-intrusive. People stay till the very end. Black dress slacks and shirt. Black hat. I will DJ for any length of time. My standard time is UNLIMITED! ABSOLUTELY. I think the bride should be available for the DJ! It depends. I've done a few Filipino events and an African event. I have access to the right DJ for the job no matter....I will not take a job I am unqualified for. Thats honesty for you. 3 hours setup. 1.5 hours is used to set up, 30 minutes for fine tuning. 1 hour for troubleshooting or problems. I always allow time for anything that might go wrong. Your DJ should! Backup system also on hand AND I have my own tables! Yes, its a large setup. 25' by 12' preferred generally. But I can make any space work. Yes, I emcee the reception, No I don't talk between every song. I'll talk whenever I'm going to musically rotate the floor. I usually eat before I come. If a meal is offered, I won't turn it down. But I'm never on "meal break"
Do you have backup plan in case you become unavailable on the day of the event? No overtime rate. All inclusive pricing. No charge for travel expenses. All inclusive pricing.